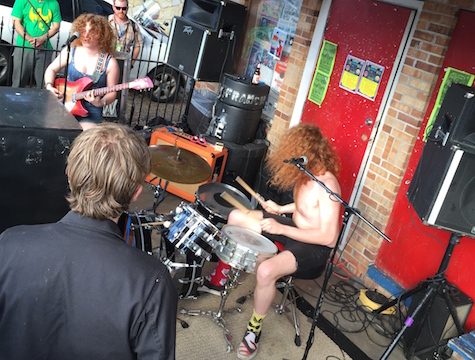 See Through Dresses on Daytrotter TV. Sam Martin of Capgun Coup fame has a new solo album that came out just yesterday on Bandcamp called Slack City. It’s a full band recording and classic Martin low-fi garage goodness. No details who’s playing on this with Martin. Maybe it’s just Sam? Anyway, check it out here and below. Meanwhile, David Nance has been busy creating a “loving interpretation of the classic 1972 Doug Sahm LP, but certainly not a note-for-note recreation.” I had to look up Doug Sahm. According to Wiki, the Texas songwriter co-founded the Texas Tornados with Augie Meyers, Freddy Fender and Flaco Jiménez. In 1965 he formed the Sir Douglas Quintet and had a top-20 hit in the U.S. with “She’s About a Mover.” Nance’s album is limited to 100 hand-numbered copies with paste-on covers and insert. Order it here. Very psychedelic! 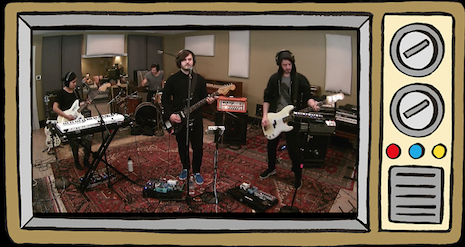 See Through Dresses’ Daytrotter session went online a couple days ago. Recorded Feb. 15 in the Horseshack, you can now watch the performance as well as simply listen. Check it out. A follow-up on the item posted a couple weeks ago about Simon Joyner’s Kickstarter campaign… It only took Simon a few days to reach his $6,000 goal to help fund the final recording, mixing and manufacturing expenses for his 13th full-length album. With 19 more days left in the campaign, Simon is now pushing $9,000 in pledges and there are still tons of cool awards left for those of you who haven’t pledged (and even for those of you who have). Check it out. Yeah, I guess you could say that I got screwed, but to be honest, I never expected to get anything from those two pledges other than a chance to help the artists involved. I gave because I supported the cause, and if in the end they were able to pass along the promised rewards for my generosity, that was cool. If not, well, I was only out a few bucks. That said, I know I don’t speak for the majority of people who make pledges on Kickstarter. They expect to get their booty if the campaign reaches its goal. What could be a cool thing could easily turn into a dead albatross hung around the artists’ neck along with a lot of bad PR. If my track record with Kickstarter reflects a national trend, I can’t see its popularity lasting very long. But if my experiences have been the exception to the rule, Kickstarter could become the ultimate method for artists to allow their fans to “pre-order” their next record, effectively generating money needed to cover production before the record ever hits the store shelves. Who knows, maybe Digital Leather and that film producer will fulfill their Kickstarter commitments… eventually. I know Simon will. 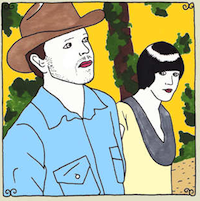 Saddle Creek band Big Harp joined the legions of acts that have recorded a Daytrotter session. Theirs went online today, right here. The duo of Chris Senseney and Stef Drootin-Senseney sing three songs from their White Hat debut, plus “Other Side of the Blinds.” It’s been awhile since I stopped in at Daytrotter. I hadn’t realized that they’d begun a “membership” model, and I can’t say I blame them. Doing what they do isn’t cheap. Becoming a Daytrotter member is a mere $2 a month, and well worth it. But you can check out Big Harp’s session for free with a trial membership.